Cooking afloat and ashore - it's always fun and often exciting in my galley. What's your favorite apple dessert? RL loves Crispy Apple Crisp while I'm more a fan of Apple Crostata. 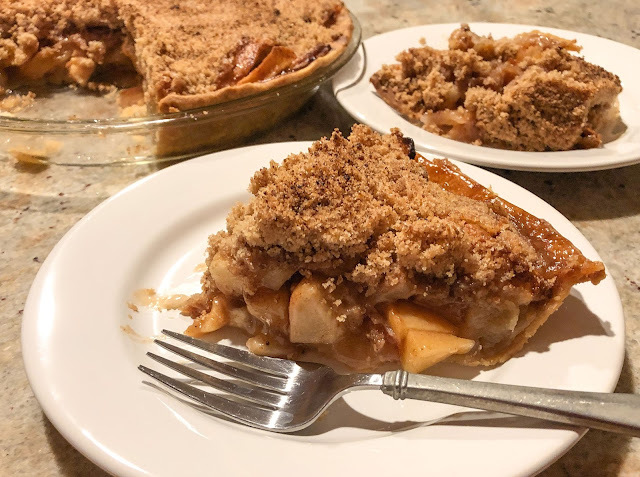 Admittedly we're both fond of all manner of apple dishes, but currently this one-crust Apple Pie with a generous topping of streusel ranks high on our list of favorite treats. Some would call this a Dutch Apple Pie, others might argue it is a French Apple Pie. Whatever! this one-crust apple pie mounded high with a nutty, cinnamon streusel is just plain delicious. Apples claim star billing in this non-fussy, uncomplicated dessert. 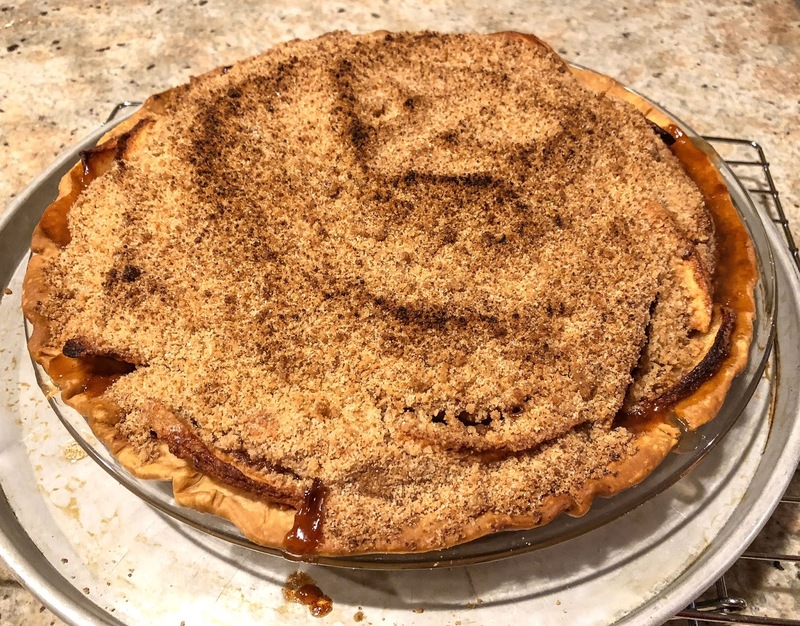 Its tantalizing appley aroma filled the entire house as the pie baked, stirring appetites and expectations alike. Letting the pie cool enough to set the filling challenged my patience; it smelled so good! Unable to wait until fully cooled, I sneaked a spoonful, one single bite, to savor the smooth, sweet fruit and crunchy topping. Mmmmm, yes! the heady, sweet flavor called for a generous slice... or two. No whipped cream or ice cream needed. The pecan streusel topping contributes a tasty, toothsome contrast to the delicious filling, but really, this is all about the apples. Are you tempted? Go ahead, give this pie a try and let me know your results. Or check out My Recipe Index for some other apple recipes. Preheat the oven to 415 F. Place a single unbaked pie crust in a 9-inch pie pan and set aside. Peel, core and thinly slice the apples; set aside in a large bowl. Sprinkle the slices with the lemon juice and toss to coat. In a small bowl, add the remaining filling ingredients and mix to combine. Sprinkle this mixture over the apples; toss to coat. Spoon the apple mixture over the unbaked pie crust, mounding the apples higher in the center of the pie shell and arranging to fill any gaps or holes. Mix the ingredients together in a medium bowl, working with your fingers until crumbly (or give them a few quick bursts in a food processor). Sprinkle carefully and evenly over the mounded apples in the pie crust. Lightly pat smooth to firm somewhat. Bake the pie in the preheated 425 F oven for 12 minutes. Reduce the oven temperature to 350 F and continue to bake for 35-45 minutes longer. The apples will be tender with juices oozing and bubbling in the center of the pie and around the rim. Cool on a wire baking rack to set the filling. Cut into wedges and serve, with or without ice cream or whipped cream. 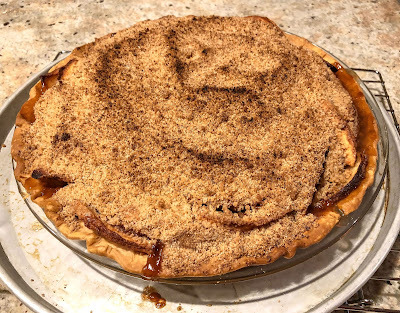 French Apple Pie: a little messy but tasty, a bit like life. It's February... already. Hilary arrived with a hand-decorated heart plate piled high with a stack of healthy and delicious cookies, a reminder that yet another holiday arrives next week. We ate the cookies during her visit, before I even thought to grab a photo. Valentine's Day is just one week away - now how did that sneak up so stealthily when the last of the previous holiday trimmings are barely tucked away in storage? Denial on my part perhaps, while studiously ignoring the calendar and some promising signs of Spring outside the kitchen windows. Winter hellebore bloom alongside clumps of energetic daffodil stalks that daily shoot skyward so quickly you can almost see them grow. 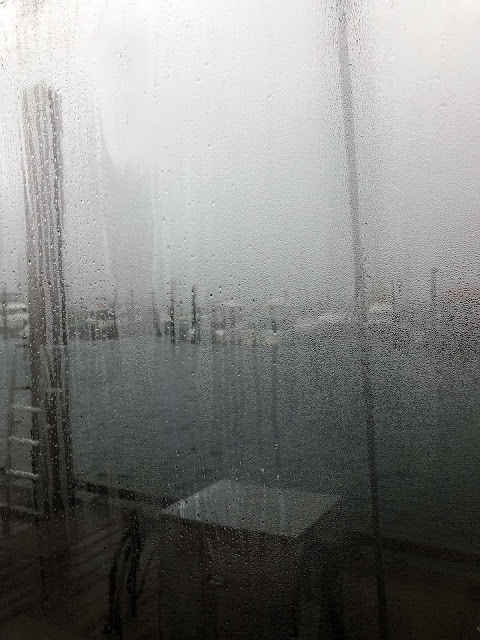 When we spent time aboard the boat last month the view from the boat galley was more wintery, gray and wet with gale force winds and occasionally white-capped surf inside the marina. 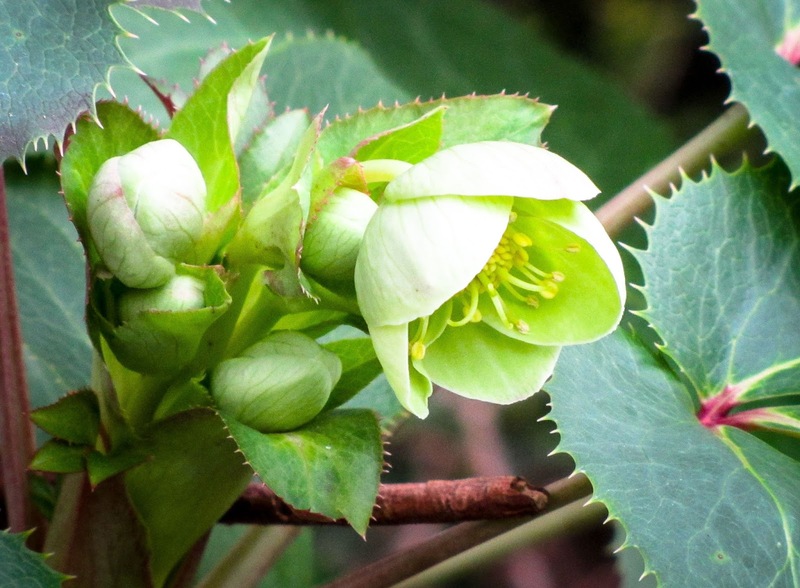 No promise of Spring observed here yet. 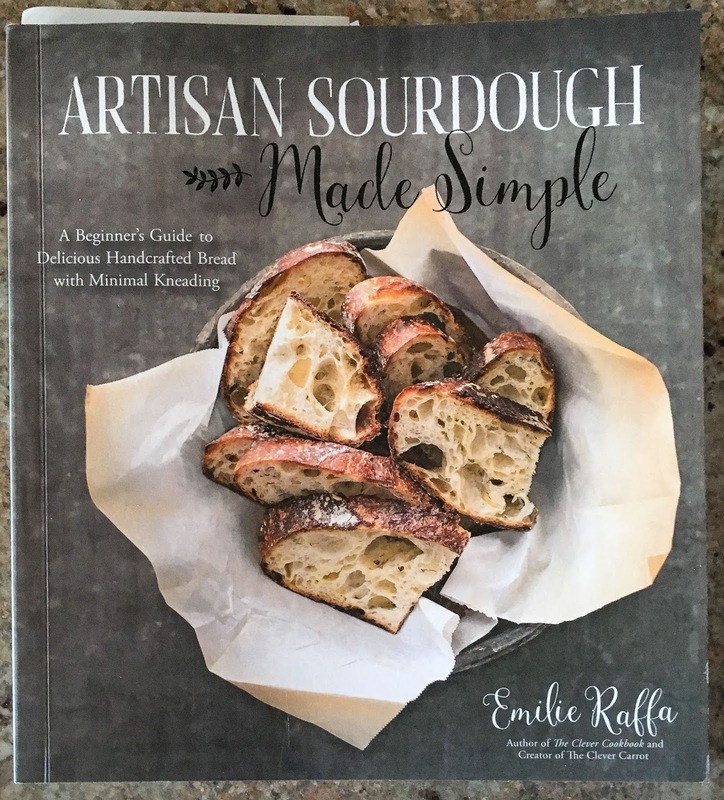 *...Emilie Raffa's sourdough cookbook, so highly recommended by numerous IMK bakers. My breadmaking has suffered lately, disappointingly inconsistent loaf to loaf with several epic failures. It's time to go back to basics, quit "winging it" and strengthen my starter, Old Faithful. Wish me luck. * ...a colander, bowl and pitcher that match other Sam Scott pieces in my collection. The artist's work is available at his studio in north Seattle, in numerous galleries, online at Etsy, etc. 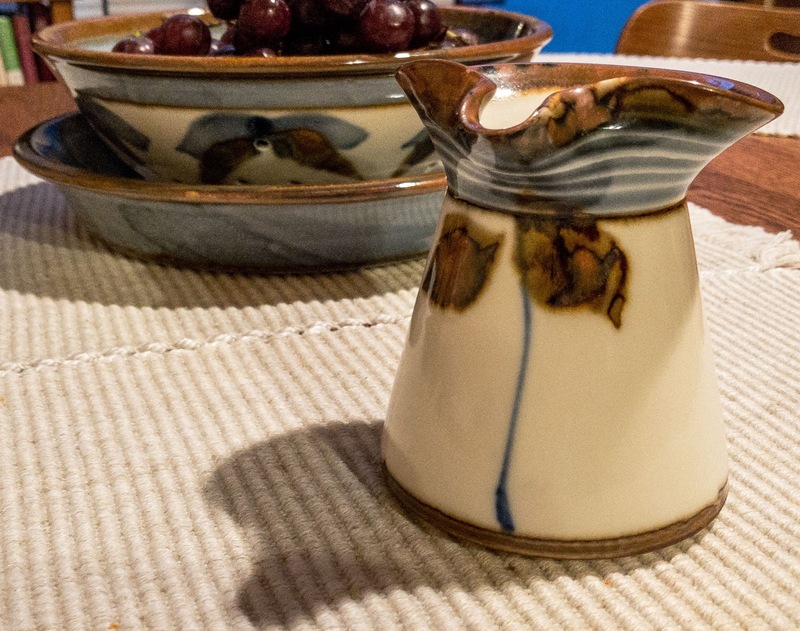 but I'd rather pick up a few pieces each year at the local Seward Park Clay Studio. 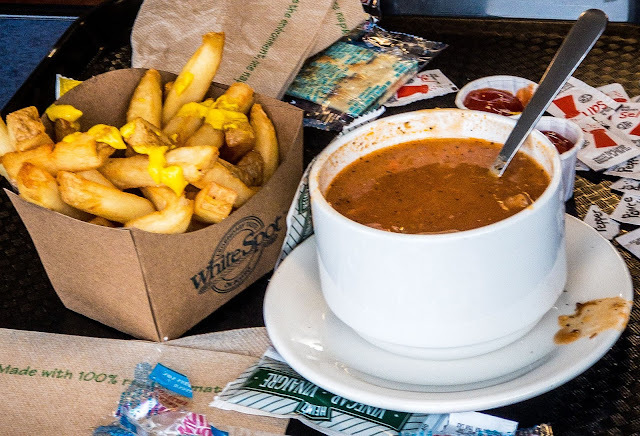 *...plus a few more soup bowls, just because. It's time to rotate out the early marriage bowls no longer in use, the ones that hold nearly four cups. Hmmmm, did we really have appetites that large all those many years ago? 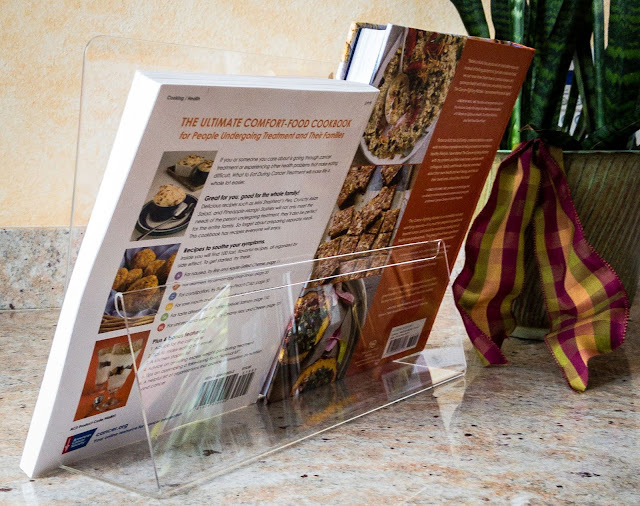 *...a new cookbook holder that can accomodate fat cookbooks as well as a thin iPad. 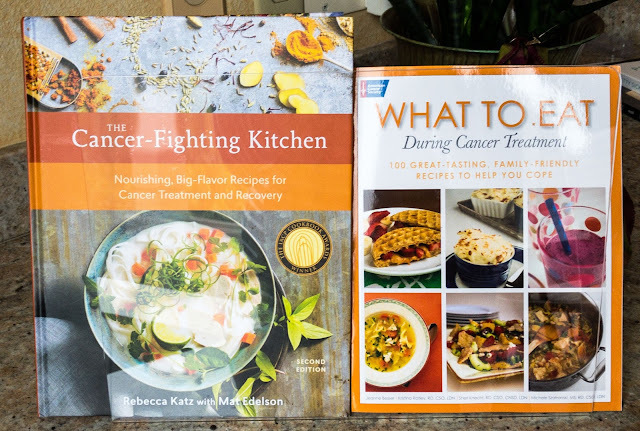 Yes, you can tell by the titles of the new cookbooks contained inside that I'm off on another food challenge addressing potential treatment side effects. New cooking adventures, here I come. What's happening in your kitchen lately? 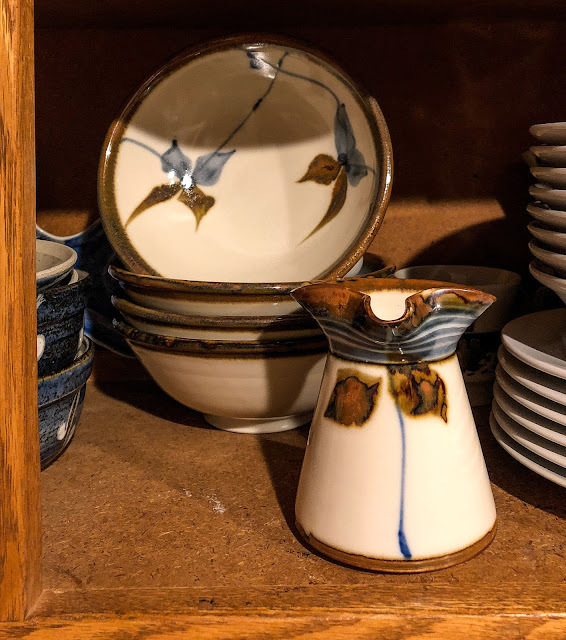 Click over to Sherry's Pickings for a monthly peek into interesting lives and kitchens around the globe. Good things happen in the kitchen.